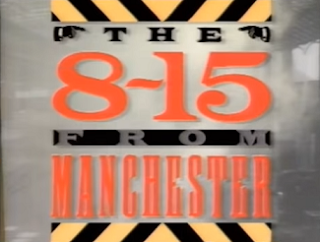 A two series wonder, The 8.15 from Manchester, aired on Saturday mornings to cover the gap in the schedules left by Going Live's break between series. Believe it or not, but episodes started at 8.15am and were filmed in, you got it, Manchester - specifically the BBC Manchester studios. Being the early 90s, Madchester was in full flow, so coming on board to create the insanely catchy theme tune were baggy popsters Inspiral Carpets. Ross King and Charlotte Hindle presented both series with Barry Foy contributing to the first series and weathergirl Dianne Oxberry joining the team in the final series. Being a Saturday morning kids show, you can pretty much guess what it consisted of: cartoons, pop stars, guests and various game show segments. A whole range of pop stars appeared with early TV appearances by Blur, Take That and, uh, That Petrol Emotion with a number of these segments immortalised on YouTube. 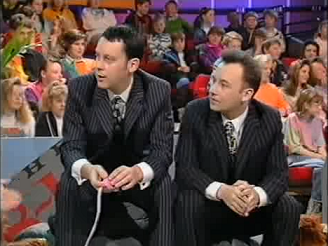 Game shows featured included 'It's Tough at the Top' which saw children playing on a 3D board with a sort of Aztec/jungle theme where questions had to be answered and avoid landing on the slide squares which sent the unlucky child flying down into a pool of gunge. This was later replaced with 'The Wetter The Better" which found children and their teachers taking place in a series of games at Blackpool's Sandcastle Leisure Pool - the main aim of the game was to get the contestants soaking wet in a variety of ways, but Ross King was eventually soaked at the end of the final edition. The 8.15 from Manchester also saw the debut of US cartoon Rude Dog and the Dweebs, but looking deep into British TVs past there were also repeat showings of Rentaghost and Grandad. There were repeats of American imports too with The Jetsons and Defenders of the Earth each getting a run out over the course of the series. 1. The theme tune by the Inspiral Carpets is a slab of baggy, melodic greatness which makes me yearn for the days of bowl haircuts and flared jeans - the theme tune is actually a slightly retooled version of the band's hit Find Out Why. And, of course, at the time of the second series, Michael Howlett from my class moved to Colchester and, for at least 3 minutes, everyone in our class seemed to be singing "THE 8.15 FROM COLCHESTER!" at him. 2. Even back then, aged 7/8, I was a Dad's Army fan so the opportunity to see Clive Dunn in another sitcom - a rarity at the time and even more so now - was an absolute treat. And I bloody loved Grandad - I've still got a VHS tape which has Grandad scrawled on the side of it, but it's since been recorded over sadly. The series wasn't, however, the most wildly successful slice of Saturday morning children's TV and the two series lifespan seems about fair. It's a riotous enough addition to the canon of children's TV, but it doesn't quite hit the iconic highs of contemporary shows such as Going Live! and Live & Kicking. What's most interesting about flicking through the clips on YouTube and the listings on BBC Genome, though, is the variety of bands which featured and ensures that, at the very least, The 8.15 from Manchester acts as a curious time capsule of early 90s music. Great post! 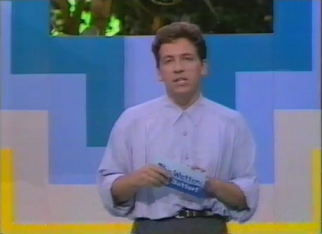 Everytime i see Ross on tv as Lorraine Kelly's LA correspondent i remember his glory days on this! :) They Might Be Giants were on it once as i recall. Yes, TMBG popped up in one edition! Being a relatively local lad this was great. TV back then didn't seem to come from places we knew, it was all down in that there London town, so it was really refreshing to see something come from Manchester and the series was definitely one of the better summer replacements for Going Live. Diane still does the weather on North West Tonight every weekday, she's a local heroine! I think Parallel 9 replaced The 8.15 from Manchester the following year. All I really remember about that was that Brian the Dinosaur was operated by David Claridge aka Roland Rat. I distinctly remember this one, especially the theme tune which has stuck in my head over the years. No small feat as I was only 5-6 at the time! I had it in my head that The Wetter The Better was a separate show altogether rather than a part of 8:15. I also remember both Rentaghost and Grandad being a part of it, as I recall watching both and as far as I'm aware they weren't shown on kids TV otherwise in the 90s. No one I mention it to remembers it at all, so it's nice to see someone else reminiscing. (compared to Up2U, Parallel 9 etc). The 8:15 established it's own identity straight away and escaped the traps of both blandness and trying-too-hard. Diane Oxberry is still a familiar face to North West viewers as weather-woman on the BBC local news. She generally has to forecast rain for Manchester - no great surprise.